Volunteers. Who they are and what they do to reach kids and families is amazing. Each week, they give of their time, talents and treasures to help the next generation know and live out the truth. Ministry is busy. So busy, that at times, you can forget to let your volunteers know how much you value them. But it is critical that we show volunteers how much we value them. Volunteers that are not valued will vacate. Let's think about a few ways we can show volunteers how much we value them. I think the starting point is verbally telling them that you value them. They need to know on a regular basis that you appreciate them and value their ministry. A handwritten note is another great way to tell your volunteers that you value them. In the note, bring up something specific that the volunteer does that you appreciate. Here's a sample letter I would write to a volunteer. This morning I was thinking about what a great day we had yesterday in children's ministry. I was also thinking about you and the part you play in the ministry. Yesterday, I noticed how you made the new little boy feel welcome. You brought him into your group and made him feel right at home. It was a great reflection of your heart for the kids in our community. Have a great week and know that you matter and your ministry matters. Thanks for being a difference maker. A small gift can express your appreciation for volunteers. Especially when a volunteer realizes you went the second mile to make the gift personal. One way to do this is have each volunteer tell you their favorites. You can have them fill out a simple paper that asks what their favorite candy, movie, drink, coffee, restaurant, etc. is. Then, on their birthday, you can pick something from the person's list to give them. You can also do this on a normal weekend and let them know you value them and wanted to show them in a small way how much they mean to you and the team. A cookout, dinner, party or other appreciation event is a great way to show your volunteers you value them. The end of the school year is a great time to do an appreciation cookout for volunteers. Christmas is also a great time to have a party or event for your volunteers. One year, I gave each of our volunteers a Christmas ornament. 15 years later many of them still have the ornament and put it on their tree every year. The more valued a volunteer feels, the more they will enjoy serving on your team. We've all heard the statement, "people don't quit a job, they quit on a boss." The same applies to volunteers. They don't quit a role, they quit because they don't feel valued or cared for by leadership. Valuing volunteers is one of the most important things you can do. Once they know you value them, they will support you, follow you and go the second mile for you. Take a close look at any ministry that is thriving and you'll see volunteers who are serving with a smile on their face because they know they are valued. 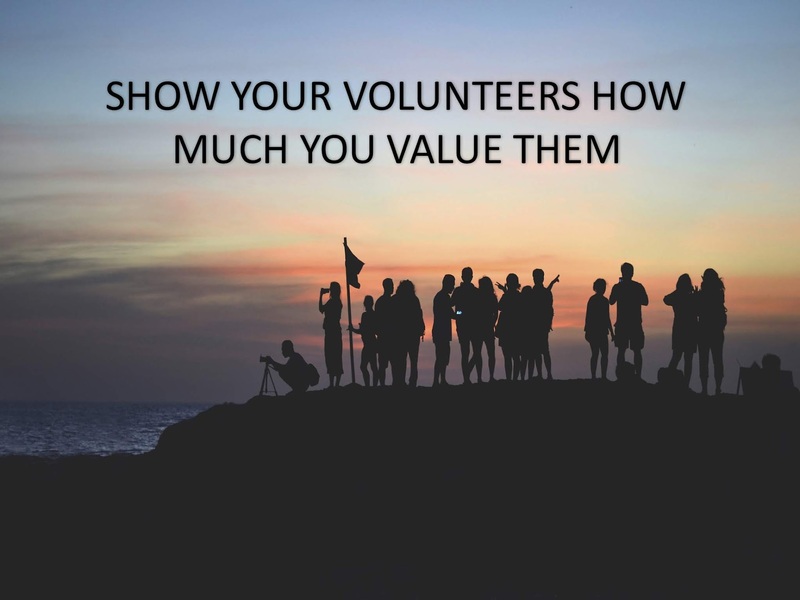 Have you gotten too busy to show your volunteers you value them? Have you stopped saying "thank you. I appreciate you?" You can change that starting now. Grab your cell phone and text one of your volunteers that you haven't connected with lately. Tell them how much they mean to you and the ministry. It may be the most important thing you do today. I can promise you this - it will make a difference. Turn it into a weekly habit and you'll see new energy and excitement rise among your volunteers. Thanks for reading this post today. I appreciate you and your commitment to grow as a leader. You are the reason I am writing this. I value you and your friendship in ministry. You can get more great ideas for leading and valuing your volunteer team in my book "The Formula for Building Great Volunteer Teams." It has been called the best book on the subject of volunteers. You can get more info. and get it at this link. It's available in both paper back and ebook formats.